Cook the quinoa in a medium pot with 2 cups of water. Bring to a boil, reduce heat to low, and cover with a lid. It should be done within 20 minutes. In a large skillet, heat up the oil. When it’s hot, add the garlic and saute until fragrant. Add the rest of the vegetables and stir fry until they are cooked through. Add the cooked quinoa to the skillet and mix it in with the vegetables. Stir in a little soy sauce for flavor. Let it fry until pieces become slightly crispy. Meanwhile, beat two eggs in a bowl. When the grain and vegetables are about done, drizzle the beaten eggs over the mixture and carefully stir until the eggs are distributed evenly. When the eggs look cooked, remove the skillet from heat. Plate and serve with a tad of sriracha (optional). Health Notes: Health nuts have been raving about quinoa for a while now. It’s packed with protein and provides some omega-3-fatty-acids. 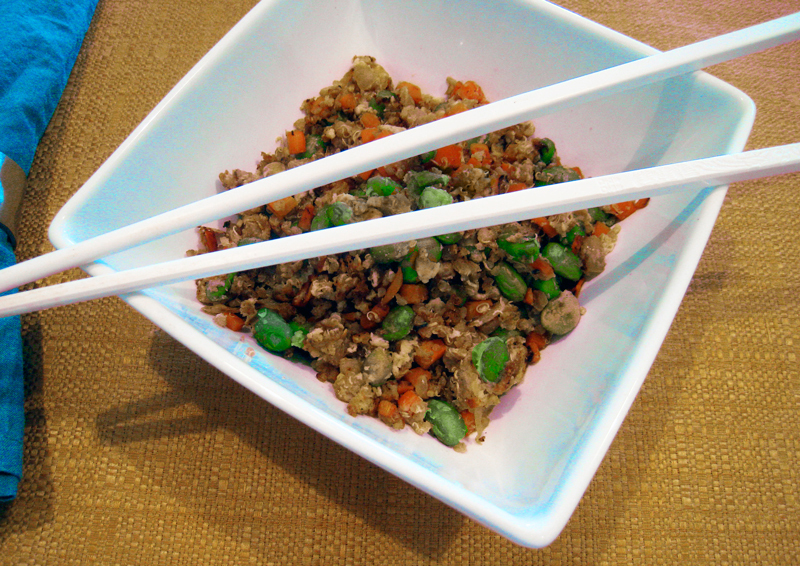 The eggs and edamame also provide protein. Not only are the vegetables are low in calories and high in nutrients, but they also add bulk to keep you satisfied and full of energy! Yum! looks great! can’t wait to make some for the family! I must say, with quinoa? this is unique, need to give it a try! !